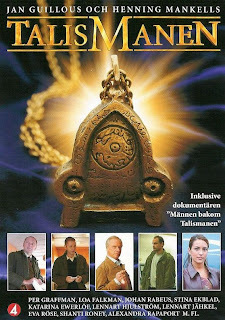 Not having grown up in Sweden, I'm sure I missed some of the finer nuances in the TV series Talismanen, but I was savvy enough to pick up on a few of them. The hugely popular authors Henning Mankell (which I was surprised to learn is pronounced MANK-el, not man-KELL) and Jan Guillou play themselves, and Mankell's most famous character, Kurt Wallander, also makes an appearance. The story consists of 8 parts and revolves around the talisman, a small pendant which brings bad luck to all who obtain it by false pretenses (in other words, everyone who touches it, basically). It also seems to have some sort of magnetic power, because people who see it cannot resist taking it even though it is a fairly ugly piece of jewelry. Our hero in this story is a disgraced policeman named Wallton (which my husband pointed out was a combination of Henning Mankell's detective Wallander and Jan Guillou's spy Hamilton). Sent to prison for beating a handcuffed prisoner, Wallton is approached by a fellow inmate with a job offer to track down the lost talisman once he is released from prison. At first, Wallton is uninterested, but the lack of any other jobs and the dissolution of his marriage leave him little choice. As a detective, Wallton stays just one step behind the talisman. Since it is cursed, he always manages to locate the dead body that the talisman was recently stolen fro m. Naturally, his presence at numerous murder scenes does not endear him to police, and he spends several nights in jail while his stories are checked. At one point, he sees an interview on a train station monitor with Kurt Wallander, in this incarnation played by Lennart Jähkel. While I adore Jähkel, and he does a reasonable enough job as Wallander, I'm still pushing for Trevor Eve to portray the good detective at some future point. It is amusing to see how the two authors work themselves into this story. Wallton originally approaches them in a bar to see if they can shed any light on the origins of the talisman. The story he tells is so fantastic that Mankell and Guillou decide to write a TV series based on it. In the meantime, there is a somewhat odd side story where the apparently controversial Guillou shoots and kills some actors from a reality-type series who "storm" his house. I'm not sure what that had to do with the story, other than to give Guillou more screen time. Mankell, for his part, is mugged on the way to deliver the first part of the series to the TV station, setting up a final confrontation between Wallton and the talisman. There are also many famous Swedish actors who show up throughout the series, including Alexandra Rapaport, Katarina Ewerlöf, and the hunky Per Graffman as Wallton. The always adorable Shanti Roney also makes an appearance, but the shaved head look really isn't for him.